In this post I show how to improve textarea usability with a Twitter-style character counter. Validating form input length is a common strategy for reducing errors. So common in fact that the HTML specification provides a maxlength attribute for input fields. Starting with HTML5, multiline textarea fields support the attribute too! 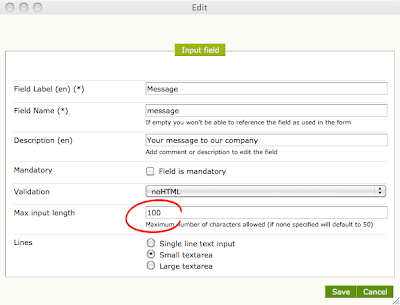 Since it is always better to prevent an error than catch one the user already made, here are two ways to improve textarea usability in Magnolia CMS, making sure the user knows how many characters are allowed. The obvious improvement is to display the character limit. 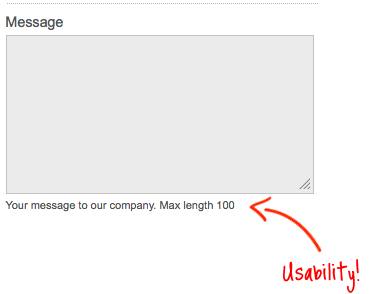 In Magnolia CMS, you set the limit on the form field. The system saves it to a maxLength property in the repository. Copy the formEdit.ftl script which renders input controls. Create folder Templating Kit > Templates > /form/paragraphs. Create a new template script formEdit and paste the copied script into it. Render the maxLength property in the textarea element on line 21. Enable the script and refresh the Contact form page. How does the user know they are approaching the limit? 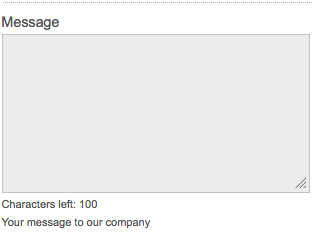 jQuery Charcount plugin adds a Twitter-style character counter. As the user types text, the plugin counts unused characters. When a limit is exceeded, the counter turns red. jQuery.js is the core jQuery script. Magnolia CMS already has it. charCount.js counts the characters and draws the counter. CSS styles sets the alarm color. 01.html is an example page. Go to Templating Kit > Resources > /templating-kit/js/all. In the Advanced tab, set Extension to js. Paste the downloaded charCount.js script into the charCount item. Copy the document.ready function from the example 01.html file. Paste it in the charCount script before the closing })(jQuery); line. Change #message2 to textarea. We are getting the IDs dynamically. Set the warning to 10. In /templating-kit/themes/pop/css, create a new sheet charCount. On the Advanced tab, set Extension to css. Set Model Class to info.magnolia.module.templatingkit.resources.STKResourceModel. In Templating Kit > Themes > /pop/cssFiles, copy styles to charCount. Set link property to /resources/templating-kit/themes/pop/css/charCount.css. Reload the Contact page. Now the page has a counter that starts counting back from the limit. 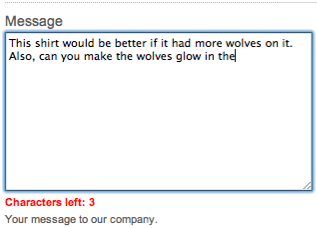 Type some text into the box. When 10 characters are left, the counter turns red.